Falcon-9 v1.1 is a liquid fueled orbital launch vehicle for medium sized missions, which is developed by SpaceX (Space Exploration Technologies Corp.). 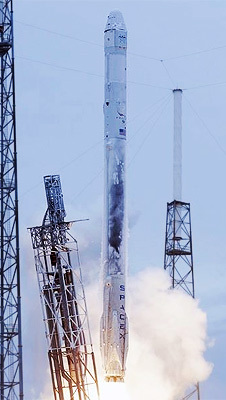 It is a version of the Falcon-9 v1.1(ex) launch vehicle with reusable first stage. Both stages are Kerosene / LOX fueled. 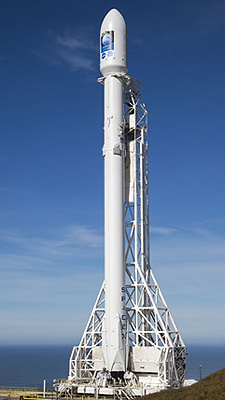 The Falcon-9 v1.1 is mostly identical to the Falcon-9 v1.1, but features deployable landing legs in stage 1. The first stage, which is potentially reusable after recovery by powered landing, is powered by 9 of the SpaceX built Merlin-1D engines with regenerative cooling. The upper stage uses a single Merlin engine and will also be potentially reusable. The Falcon-9 is offered with a 5.2 m fairing. Launch site for low inclination launches is Cape Canaveral launch pad SLC-40. High inclination launches are performed from Vandenberg AFB launch pad SLC-4E. An additional launch site at Boca Chica near Brownsville, Texas, is also under construction. The Falcon-9 v1.1 also lifts the Dragon space capsule for ISS cargo flights, which will developed into a manned spacecraft. The initial flights will land in the ocean until precission landing has been proven by the Falcon-9R-Dev ("Grasshopper-2") demonstration vehicle. Landing in the water causes loss of the stage. The first landing on a barge was tried on the Dragon CRS-5 mission, but failed.